It’s been a week since the first con I chaired ended, and I’m mostly recovered. It went very well. The core con com was experienced and worked well together. I bought some cute art prints from the artists in artist alley. When it was all over, I drank a lot of Scotch and also Bärenjäger. And a little bourbon. The highlight of the con was entirely unexpected. At one point, an attendee noticed that one of the stars of Pacific Rim tweeted that he was in Atlanta. So an “everybody tweet at Rob and let him know about the con” campaign was launched. I didn’t think much more about it, because as if he’d show up, right? 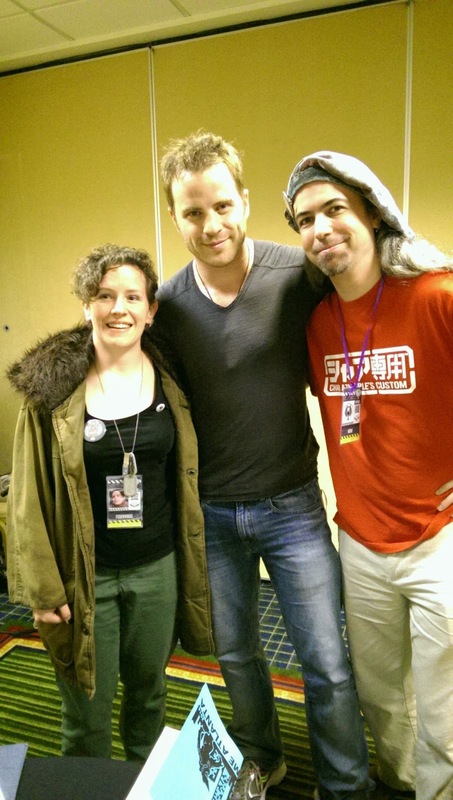 This is me, Rob Kazinsky, and Ben. He showed up. He was very nice (the complete opposite of his character! ), and he was a guest judge for the costume contest (which was about to start when he arrived). On behalf of LOCCENT Atlanta, thank you so much, Rob! I want to say how nice the attendees were. It was a very supportive, friendly environment, and so many recaps on tumblr were full of appreciation for the atmosphere. We wanted to make it a safe space for everyone, and it seems to have worked. The harassment policy wasn’t violated, and I haven’t heard of any ickiness. This was the best part of fandom–and it was diverse. This is the future of fandom.